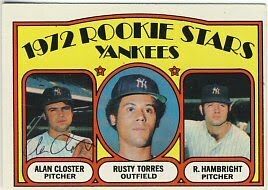 Harrelson, Colbert and Oliver Returns. Catching Up On Returns and My Wife's "Birthday"
Four more returns today. 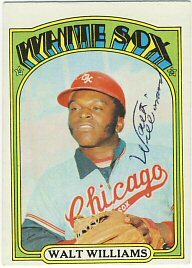 Stan Williams personalized and signed his 1972 Topps. 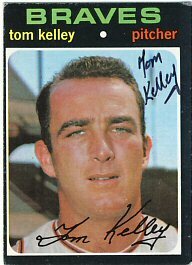 He personalized it twice, once in the dark area in the upper right of the card which is very hard to see, then again just above his signature. 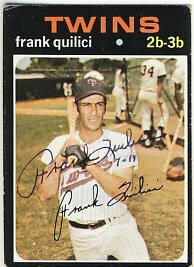 Frank Quilici signed his 1971 Topps, the 1972 Topps Twins team card, and his 1973 Topps manager card. 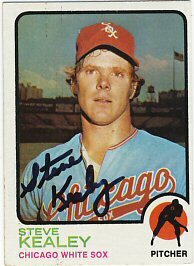 Oddly, he inscribed each one with "7-11". I'm not sure what that means. Any ideas? (Update - 7 and 11 are the two numbers he wore playing for the Twins). 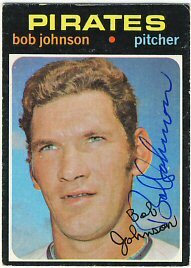 Finally, Bob Johnson signed his 1971 and 1972 Topps. 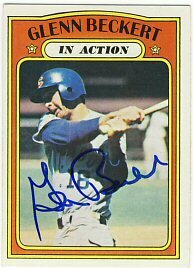 Today I received just one return. 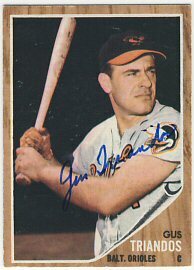 Claude Raymond signed two 1965 Topps. 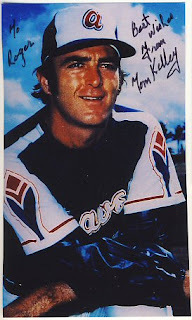 I had enclosed an extra for him to keep but he signed it and returned it. 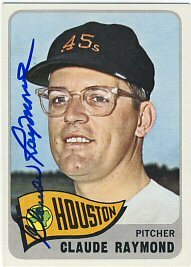 Mr. Raymond lives in Canada so I enclosed $1 to cover return postage. 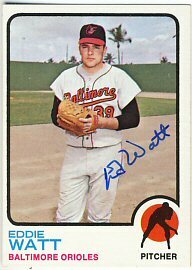 The stamp on the envelope was $1, so I hope I didn't short-change him. 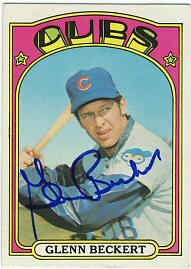 Just one return, but since Tuesdays are usually very slow, I'm happy to get it. 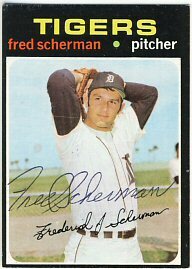 Fred Scherman signed a 1971 and 1972 Topps for me. I also received a few more Wheeldon prints that I bough on eBay. 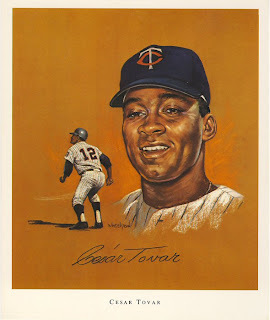 I had most of them, but added Cesar Tovar to my collection. 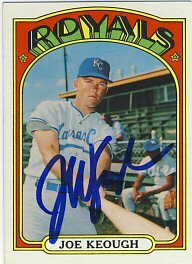 I have an extra Oliva and Kaat that my son will get signed at TwinsFest. 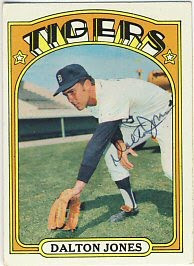 This lot also included a Killebrew. 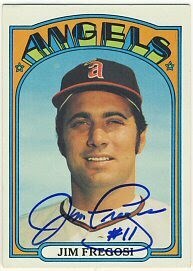 I know I have one, but can't find it! 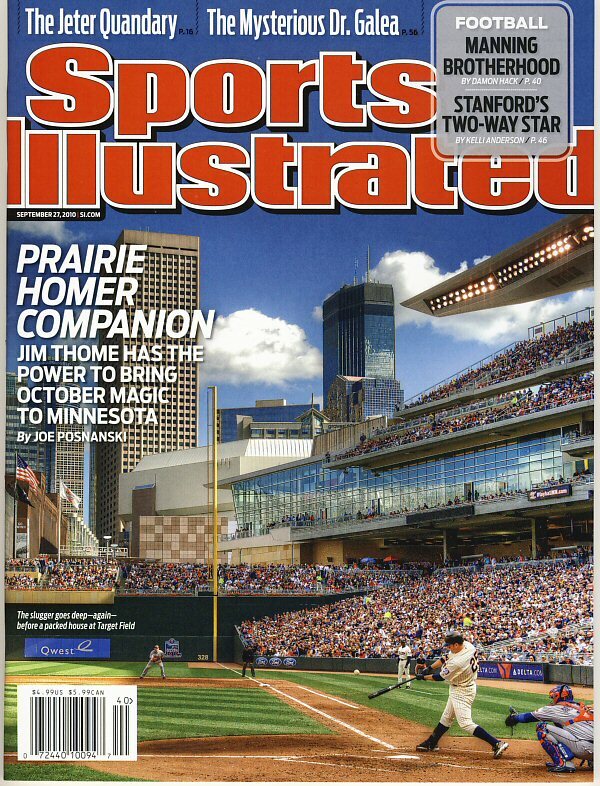 I also picked up a few copies of this week's Sports Illustrated with Jim Thome and Target Field on the cover, thanks to my Mom and sister for finding them for me when I couldn't find any locally (because I was looking too early). I haven't read it yet, but this would be a great magazine for a Thome autograph, and maybe the whole team. 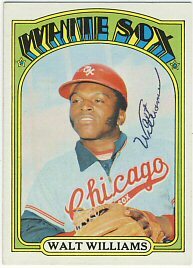 More returns today including 4 more 1972 Topps. 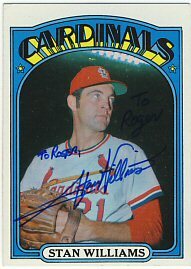 This makes 38 signed cards from 1972, or 9.5% of my goal of 400 cards. 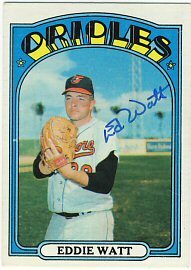 Eddie Watt signed a 1972 and 1973 Topps. 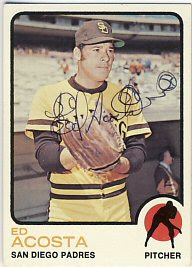 Billy Cowan signed a 1972 Topps. 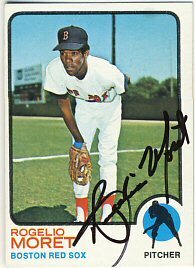 Roger (Rogelio) Moret signed his 1972, 1973 and 1978 Topps. 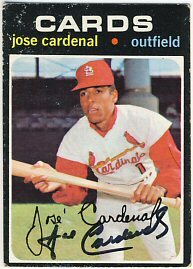 Finally, Jose Cardenal signed a 1971, 1972 and 1973 Topps. 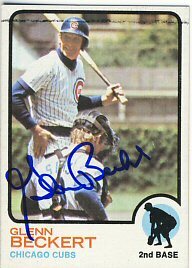 I sent out 16 more requests over the weekend. I'm hoping to keep this momentum going and continue to send out about 10 requests a week. Today I received three more returns. 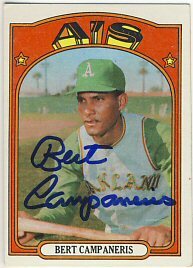 Bert Campaneris signed his 1972 Topps. 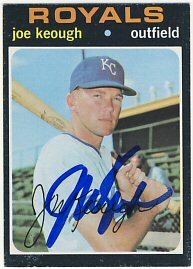 Joe Keough signed a 1971 and 1972 Topps. 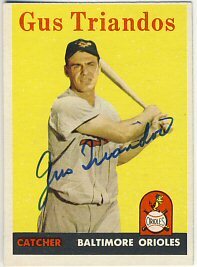 Gus Triandos signed a 1958, 1962 and 1964 Topps. My sons and I went to Cedar Cliff Collectibles today. I found a couple of old comics and some BallQube bat display cases that I'll try out. I currently don't display any of my bats, they're just stacked up in a corner. 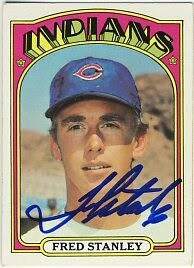 We also stopped by The BallPark in Apple Valley and found a bunch of old magazines. 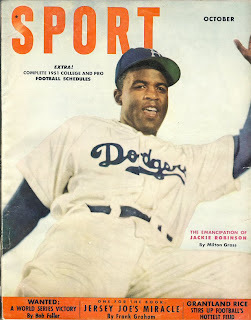 The best one is a 1951 Sport magazine with Jackie Robinson on the cover. 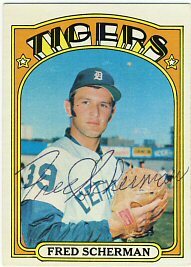 A couple more returns today. 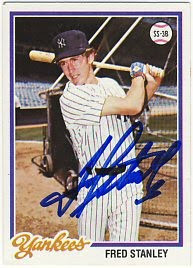 Glenn Beckert signed a 1972 Topps, 1972 Topps In Action, and 1973 Topps. 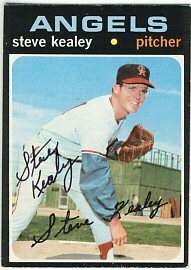 Steve Kealey signed a 1971, 1972 and 1973 Topps for me. 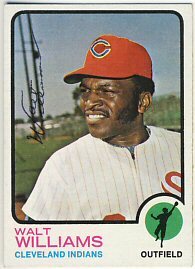 My son also got a nice return today. 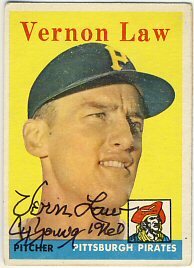 Vern Law signed a 1958 Topps for him and added a Cy Young inscription. Johnny had enclosed $5 with his request. Tonight I sorted some cards and hope to write about 15 requests to put in the mail Monday. 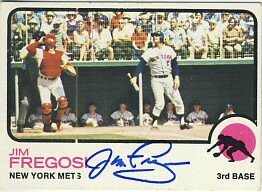 I received three successes today. 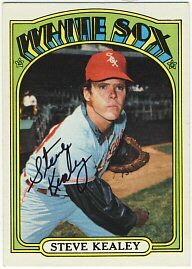 Fred Stanley signed his 1972 and 1978 Topps. 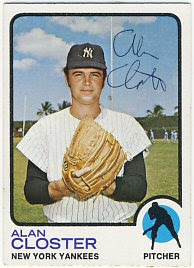 Alan Closter signed his 1972 and 1973 Topps. 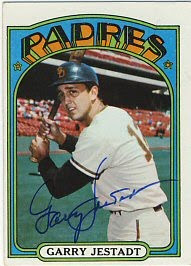 Finally, Garry Jestadt signed his 1972 Topps. 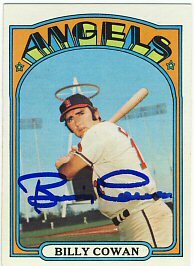 I'm up to 26 signed 1972 Topps, or 6.5% of my goal of 400. 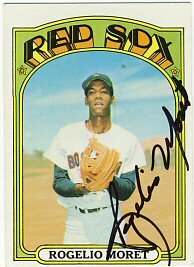 I've got about 25 outstanding requests and another stack of cards ready to write letters and send out. 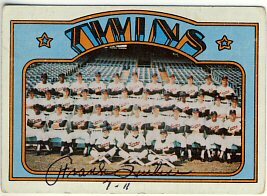 Okay, it was the "Twins", but the roster had mostly AAA players from the Red Wings. 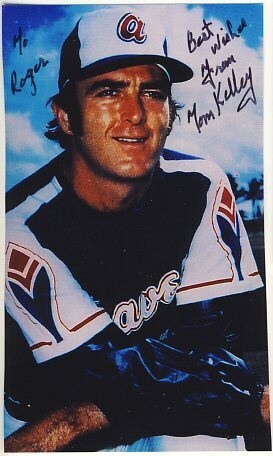 The only players that played today and didn't spend time at AAA were Drew Butera (I think), Jason Kubel and Denard Span. 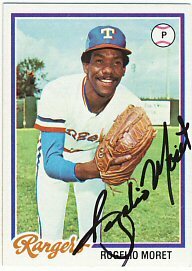 Casilla had a good day including an exciting triple. 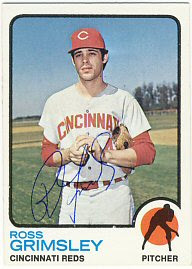 Blackburn actually pitched okay, only giving up one run in seven innings but he seemed to have to work out of a lot of jams. 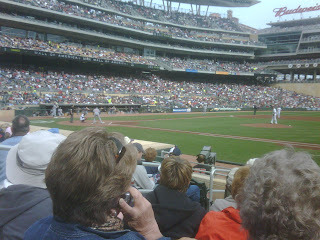 Our seats were great, dugout box #3. Yesterday I got back on request. 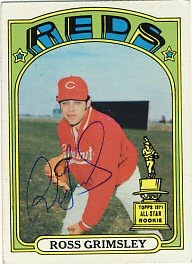 Ed Acosta signed his 1972 and 1973 Topps for me. It's a perfect day at the field. 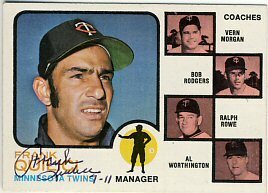 I missed witnessing the Twins clinch the pennant by a day. 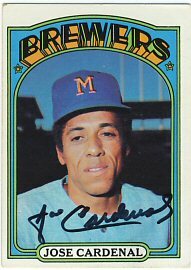 So, today is basically the AAA team playing. 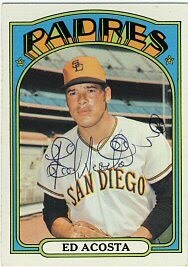 Repko, Tolbert, Casilla, Revere, Morales. 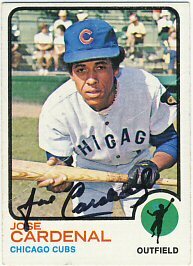 Even Cuddyer is out with Morales playing first. Oh well. 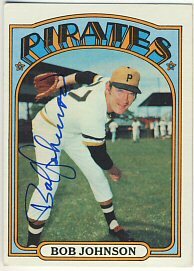 It's been a long time since I've had five returns on the same day, but I have been sending out quite a few for my 1972 Topps set. 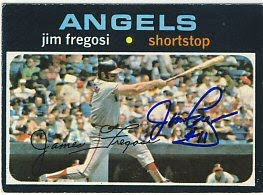 Today brought Jim Fregosi, who signed a 1971, 1972 and 1973 Topps. 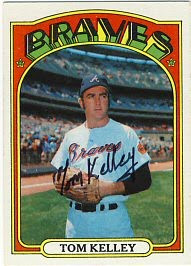 Tom Kelley signed a 1971 and 1972 Topps, as well as the extra 1972 Topps I enclosed for him to keep. 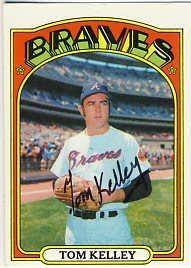 Tom Kelley also enclosed a signed picture for me. 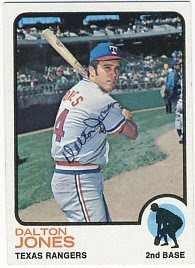 Dalton Jones signed a 1972 and 1973 Topps. 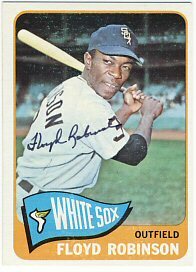 Floyd Robinson signed his 1965 Topps. 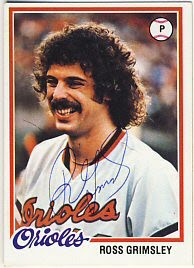 Finally, Ross Grimsley signed a 1972, 1973 and 1978 Topps. I forgot to mention a purchase I made at the Har Mar card show last Saturday. 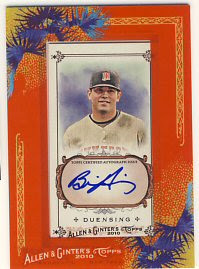 I picked up a Brian Duensing signed 2010 Allen & Ginter for $5. I mailed out another 13 requests today. 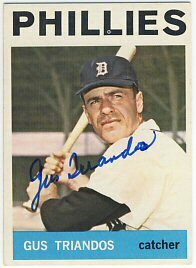 I have a few bigger items to send out like a magazine for Duke Snider and a Wheeldon print for Leo Cardenas, as well as another stack of 1972 Topps. I'll probably get to those this coming weekend.